Now you can easily remember names, faces, numbers, events, and almost any information - using simple yet powerful techniques even a 12-year old can apply! Do you find it difficult to remember the sames of people you’ve just met? Do you always have to look for your friend’s phone number in your address book before dialing his number? Do you have a hard time passing the exams because you just can’t seem to recall the lessons you’ve studied? No One is Born with a Bad Memory. Contrary to the belief of many people that sharpening your memory takes a lot of time and effort, you don’t have to be a genius to quickly know, understand, and recall what you have read or learned. Increase your sales skills and make more money! Build good relationships by recalling people’s names, faces, and interests! Enhance your career by recalling facts and numbers effortlessly! Get higher grades by studying more efficiently! Never get lost on the road again! Save lots of time by never having to find lost objects! Impress your friends with your super memory and be the life of the party! It doesn’t matter whether you’re 92 years old or just 12, anyone is capable of memorizing and recalling virtually any information possible. However, you must have the proper lifestyle, attitude, habits, and methods to possess a super memory. 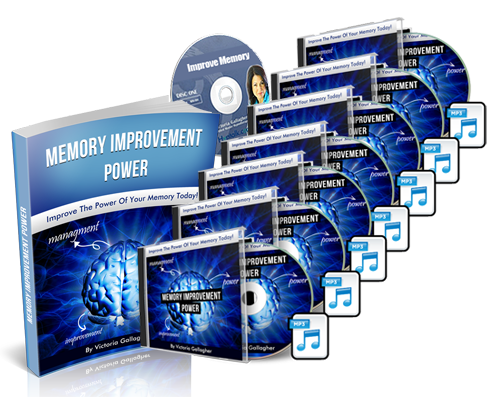 Memory Improvement Power will teach you practical and creative strategies to refine and sharpen your wonderful memory! If you want your mind to memorize numbers, facts, and other information like nothing you’ve ever seen before, then this book is for you. Two requirements before going to sleep in order to remember information better. 7 powerful tactics to overcome forgetfulness and absent mindedness. Why you can better remember a person who owes you some money compared to someone who doesn’t. Not only will you be getting this amazing study guide to help you improve your memory, but you will be getting the material in 7 easy to follow audio lessons to enjoy listening to as well! For Only $47! Do you wish that you could somehow sharpen your memory? Have you ever wondered about how the foods you eat, or how much sleep you get, affects how well your brain functions? In this chapter, we will discuss ways in which your diet, stress, and other factors, affect how well your brain functions. Believe it or not the food you eat does indeed affect how well your brain operates. By including some important key foods, discussed in this chapter, into your daily diet you can improve how your brain functions which in turn directly affects how sharp your memory is. Another way to improve your memory and functioning of the brain, is to get that much needed rest. We will discuss how the brain suffers when you do not get sufficient rest and ways to improve your memory based on the rest you do get . Another factor that will be examined in this chapter is the role stress plays on how well the brain functions and how this affects your memory. Sharpening your memory is possible. There are steps you can personally take that will improve your memory that are outlined in this chapter. Once you determine the steps you need to take in order to sharpen your memory, and take action on those steps, you will soon realize that your memory has in fact improved. Do you often have difficulty paying attention, especially if it involves something that you have little interest in? In this chapter we will discuss the two types of attention; voluntary and involuntary and we will go over ways in which to improve the way you pay attention, even when it involves subjects that you do not find all that interesting. You have the ability to train your mind so that it picks up details and information you might have missed in the past. This skill will increase the functionality of your brain and as a result will help you improve your memory. There are so many benefits when you increase your concentration and can focus on what is happening around you. Improving the way you pay attention can help you with the profession you are in, it can help with subjects you are studying in class and can even help you with your relationships. As you improve the way you pay attention you will find that you can pick up small details you might have missed before. You will soon find that learning to pay better attention to what is happening around you can really be advantageous. Not only will you be more focused and interested, but you will find that you will also be able to retain the information you gather more easily. Did you know that no one is born with a bad memory? Do you know that there are basic memory tools you can use every day that will help you improve your memory? In this chapter we will discuss the basic concept of memory as well as review the tools which you can incorporate into your everyday activities that will help you sharpen and improve you memory. As you work with these tools on a daily basis you will find that they become a part of your daily routine and that your memory will be remarkably enhanced. There are a variety of tools you can use to improve your memory. Some of them you have heard before and some you haven’t. There are some you probably already use but do not realize. What you will be taught to do is take the information you receive in and organize it in such a way that you will easily remember it. The more you use these tools, the easier it will become for you to remember pertinent information. You will find that you can actually use your senses to help improve your memory. Included in this chapter are ways that you can use your senses to gather in information, organize it and file it away so that when you need to, you can easily recall the memory. You are born with these skills already, and in this chapter, you will be given the tool and instruction you need to hone these skills and use them on a daily basis. Do you sometimes forget things that you do every day, such as locate your car keys or where you put something for safekeeping? Are you concerned by how forgetful you think you are? Do you think that you are becoming more and more forgetful as time goes on? With so much in the news about Alzheimer’s disease and other memory-related diseases, many people become very anxious when they become forgetful. The brain actually does not lose information that is stored there. Forgetfulness can happen when information wasn’t stored how it normally is stored, or maybe there is a problem with the way the information is being retrieved. In this chapter we will review ways in which information is forgotten. There are actual several ways that this happens and therefore there are a variety of ways to combat forgetfulness. The most important thing to remember, is although you may feel you are becoming more and more forgetful, there are ways you can fight this and actually improve your memory in the process. The ways to combat forgetfulness that are outlined in this chapter are not difficult. They can be easily incorporated into your everyday activity. The more you practice these methods, the easier they become, until they are ingrained in your everyday activities. Being forgetful will be a thing of the past for you. Have you ever considered how much your senses play a part in the retention of memories? Have you ever smelled something that made you suddenly recall something from the past? Or maybe you have heard a line in a song, or heard a conversation that made you remember something from your past. As we mentioned in a previous chapter, your senses do have a profound impact on how you take in and retain information. In this chapter, we will go into more detail regarding how your senses affect the information you gather in, as well as how your senses can be used to recall information and memories. As you may have already surmised, the two senses that are most important to memory retention and recall is your sense of sight and your sense of smell. Since people are inundated with visual impressions throughout the entire day, these impressions are often not paid attention to. Learning to be more aware of what you are seeing will help you retain that information in such a way that it will be easy to recall later on. The same goes for the sense of smell. The more focused you are and aware of the information you are receiving in from your senses, the easier it will be for you to recall information later on. It all starts with being conscious of how your senses affect your memory. So far we have discussed how to sharpen your memory, how to pay attention better, tools to improve your basic memory, how to overcome forgetfulness and the role your senses play in retaining and recalling information. In this chapter we will go into more specifics. We will give you the tools you need to remember such details as numbers, places and events. These are the specific details that can be very frustrating when you have difficulty recalling them. We have all experienced times when we have forgotten our ATM code or passwords we use on our computer. Or maybe you have forgotten the name of a co-worker or neighbor you met in the past, or even the week before. It is embarrassing to say the least when you cannot recall the name of someone you have met. In this chapter we will give you the tools you need to remember these details. As with the other chapters, when you use these tools in your everyday activities, they become second nature. You will find that you will use the tools without even trying. And you will find that as a result, your memories and information you are looking to recall comes to you more easily. You will be less frustrated and you will find that your confidence in your ability to remember will be greatly increased. A great deal of information and tools have been given to you to help you improve your memory. By utilizing these skills and information you will find that your memory improves quicker than you would ever have imagined. In this chapter, we will provide you with some additional memory tools. Once you have mastered the tools and skills mentioned in the previous chapters, you can then implement these tools. Or you can implement these tools as you implement the ones mentioned in previous chapters. These additional tools will assist you even more in the retention and recollection of your memories. As well as discussing these additional tools, we will also review the 7 principles of memory. Understanding these principles will give you a better understanding of how information is brought in and retained by the brain. An important aspect mentioned in the 7 principles of memory is the role that learning plays. You will find that learning is an integral part of retaining and sorting information for recall later. Taking all the techniques you have learned throughout the chapters above and using them in conjunction with what you learn about the 7 principles of memory, will greatly help you improve your memory. Before you know it, you will be able to recall information whenever you want or need to. Be a Memory Wonder the Easy Way! In this amazing book, you will discover how to hone and improve your memory like a saw. You will be able to accomplish amazing feats you never thought possible. After reading and applying the methods in this book, if you do not radically improve your memory, or if for any reason you are not satisfied with anything this book teaches, please contact us and we’ll issue a full refund immediately. No questions asked, no hard feelings. P.S. If you want to remember names, faces, directions, numbers, occurrences, and nearly every possible information out there, then “Memory Improvement Power!” will reveal how to transform your brain into a superior power tool that absorbs data like a sponge. P.P.S. Blow them away with your information-absorbing mental ability now. And if they ask you what’s your secret, just send them to this page so they can benefit just like you!